Markit was born in Tallinn, Estonia. We started with the drive of the founders to change IT purchasing forever - to make it simple, transparent, open and efficient. Starting off in 2003 the company quickly established itself as a regional market leader in the Baltics for B2B IT purchasing. The idea was simple – provide companies with a service that would enable direct purchasing of IT products from the distributors. Previously the usual model for acquiring IT products meant asking multiple quotes from re-sellers or announcing a tender with a process that took months to pursue. At the same time the commoditisation of IT products had fast begun and Markit was marshalling the change. Purchase what you need - when you need it, with a market price, direct from distributors – and do it online. In 2006 the company raised a round of capital from Ambient Sound Investments (www.asi.ee) - the investment company of the four founding engineers of Skype. Markit was one of ASI first major investments and the 2 mio EUR cash injection was aimed to help Markit with its global vision to create a pan-European online IT purchasing system which provides central ordering with local delivery. ​Markit revenue growth for more than ten years has been on average +22% every year and +34% annually since foundation in 2003. 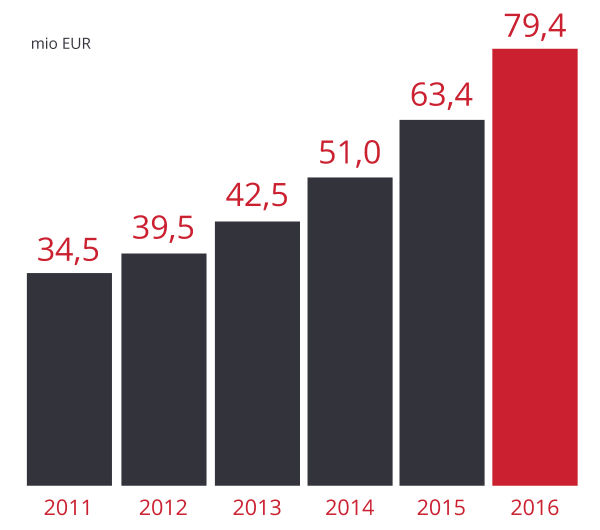 In 2016 the company posted another strong annual revenue result of 79,4 mio EUR which represents +24% growth from 2015. With more than 138 000 orders and almost 1 million products delivered every year the company is well on course for it’s ambitious milestone of reaching 100 mio EUR revenue by 2018. As we take on the world the focus of the company has remained the same – make IT purchasing simple, transparent, open and efficient. An ever-growing list of international companies are trusting and using Markit as their go-to tool for IT purchasing. We help them to save time and money.